Amazement at what God has accomplished – “The Almighty has done great things for me…” – from the Gospel according to St. Luke, is the title of the Holy Father’s Message for the 25th World Day of the Sick, to be held on 11 February, the feast day of Our Lady of Lourdes. Here is the full text of the Message, which was signed on 8 December, feast of the Immaculate Conception. On 11 February next, the Twenty-fifth World Day of the Sick will be celebrated throughout the Church and in a special way at Lourdes. The theme of this year’s celebration is “Amazement at what God has accomplished: ‘The Almighty has done great things for me….’” (Lk 1:49). 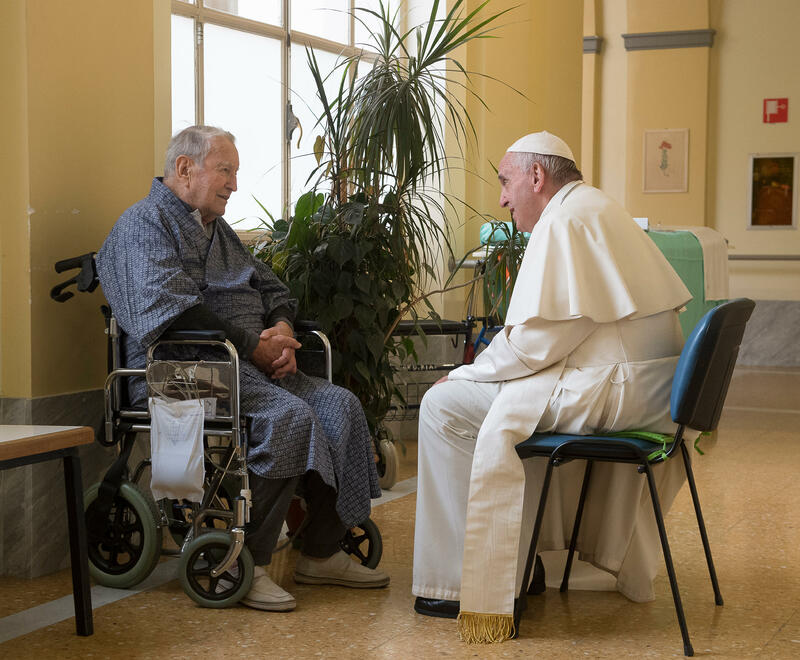 Instituted by my predecessor St. John Paul II in 1992, and first celebrated at Lourdes on 11 February 1993, this Day is an opportunity to reflect in particular on the needs of the sick and, more generally, of all those who suffer. It is also an occasion for those who generously assist the sick, beginning with family members, health workers and volunteers, to give thanks for their God-given vocation of accompanying our infirm brothers and sisters. This celebration likewise gives the Church renewed spiritual energy for carrying out ever more fully that fundamental part of her mission which includes serving the poor, the infirm, the suffering, the outcast and the marginalized (cf. John Paul II, Motu Proprio Dolentium Hominum , 11 February 1985, 1). Surely, the moments of prayer, the Eucharistic liturgies and the celebrations of the Anointing of the Sick, the sharing with the sick and the bioethical and theological-pastoral workshops to be held in Lourdes in those days will make new and significant contributions to that service. Like St. Bernadette, we stand beneath the watchful gaze of Mary. The humble maiden of Lourdes tells us that the Virgin, whom she called “the Lovely Lady”, looked at her as one person looks at another. Those simple words describe the fullness of a relationship. Bernadette, poor, illiterate and ill, felt that Mary was looking at her as a person. The Lovely Lady spoke to her with great respect and without condescension. This reminds us that every person is, and always remains, a human being, and is to be treated as such. The sick and the those who are disabled, even severely, have their own inalienable dignity and mission in life. They never become simply objects. If at times they appear merely passive, in reality that is never the case. The gaze of Mary, Comfort of the Afflicted, brightens the face of the Church in her daily commitment to the suffering and those in need. The precious fruits of this solicitude for the world of suffering and sickness are a reason for gratitude to the Lord Jesus, Who out of obedience to the will of the Father became one of us, even enduring death on the cross for the redemption of humanity. The solidarity shown by Christ, the Son of God born of Mary, is the expression of God’s merciful omnipotence, which is made manifest in our life – above all when that life is frail, pain-filled, humbled, marginalised and suffering – and fills it with the power of hope that can sustain us and enable us to get up again. On this Twenty-fifth World Day of the Sick, I once more offer my prayerful support and encouragement to physicians, nurses, volunteers and all those consecrated men and women committed to serving the sick and those in need. I also embrace the ecclesial and civil institutions working to this end, and the families who take loving care of their sick. I pray that all may be ever joyous signs of the presence of God’s love and imitate the luminous testimony of so many friends of God, including St. John of God and St. Camillus de’ Lellis, the patrons of hospitals and healthcare workers, and St. Mother Teresa of Calcutta, missionary of God’s love.